Rhinoplasty (nasal surgery) is one of the most popular cosmetic surgeries done. Rhinoplasty can dramatically change the appearance of the face (from a frontal view as well as the profile) and can change the function of the nose. People seek rhinoplasty for various reasons: to refine a bulbous tip, narrow a wide now, straighten a crooked nose, and/or remove an unwanted bump. If necessary, Dr. Perkins can also correct obstructive airway problems, such as a deviated septum or bone spurs, at the same time. Nasal surgery can be performed as an open or closed procedure. The open procedure will leave a small external scar. At Cosmetic Surgery Center, the majority of surgeries that Dr. Perkins performs are the closed technique which allow incisions to be hidden inside the nose. What is a good age for rhinoplasty? Surgery on the nose is best when a person is in their late teens (or older) as the nose has likely finished its growing phase by then. This leads to a more desirable result. Is rhinoplasty done under general anesthesia? A combination of local anesthesia, oral, and intravenous sedation keeps the patient comfortable and unaware. General anesthesia is not needed. What happens after a rhinoplasty surgery? Immediately after surgery there will be minimal pain that is controlled with oral medication. Some stuffiness is also experienced, similar to a mild cold. There is seldom a need for nasal packing, but an external dressing is in place for the first week. How much recovery time is there after the nose surgery? Patients of Dr. Perkins usually return to work at 7 to 10 days post surgery. Light walking, stationary bicycle and treadmill are allowed after a few days. Aerobic exercising may be gradually resumed after three weeks. The majority of the swelling subsides within the first two months, but the final results will take about a year to be fully realized. 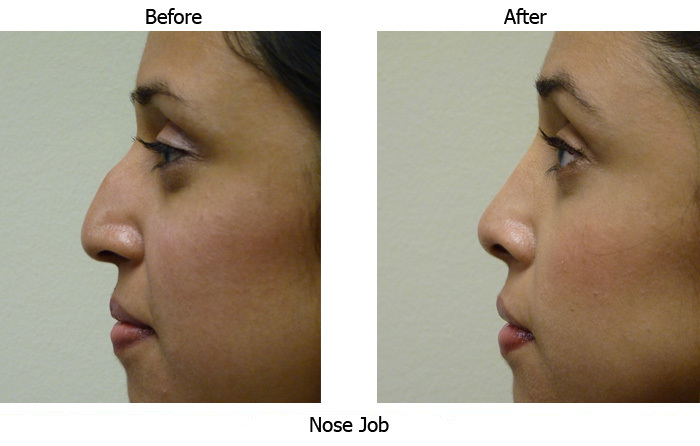 See more before-and-after pictures of rhinoplasty nasal surgery patients by on the Cosmetic Surgery Center website. All pictures are actual patients of Dr. Perkins. Santa Barbara cosmetic surgeon Terry J. Perkins, MD, specializes in facial cosmetic surgery and liposuction. Contact his office at 805-563-0000.